From Dutch Amerikaan + -er. From Amerika +‎ -er, with an additional n.
Alteration of the former name Ammoniakaner, so named from the ammonium bicarbonate that may be used as leavening. 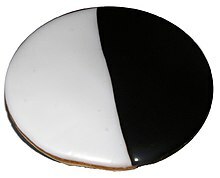 A round cakelike pastry of flour, butter, and lemon juice, with a sugar glaze, usually plain white, chocolate, or half-white/half-chocolate.